I offer the highest quality hair on the market right now i personally handpick the finest Indian hair, Brazilian Hair, and Chinese hair being the crème de la crème of hair extensions due to its matching texture of your existing ethnicity of your own hair living up to my reputation as a all natural appearance. All Handpicked hair of your choice and texture is considered to be the world's most luxurious hair because it is 100% Virgin hair dyed once for you and remains very soft and stylish. 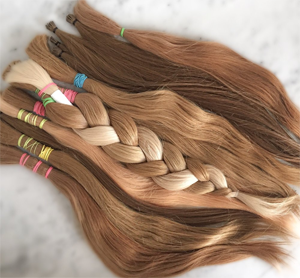 Hair Artistry by Kelly Hill offers a full range of 100% human hair extension products which are famous for being naturally silky in texture and consistent in length from root to tip. You can choose bulk hair, Flat Tabs and Tape ins, Headdress Hair Pieces and customs in all sizes and lengths using the perfect hair texture for you .All hair products are available in a full array of colors.